Map of larger region that the lakes are in, including the so-called Great Rift Valley. The Rift Valley lakes are a series of lakes in the East African Rift valley that runs through eastern Africa from Ethiopia in the north to Malawi in the south, and includes the African Great Lakes in the south. These include some of the world's oldest lakes, deepest lakes, largest lakes by area, and largest lakes by volume. Many are freshwater ecoregions of great biodiversity, while others are alkaline "soda lakes" supporting highly specialised organisms. 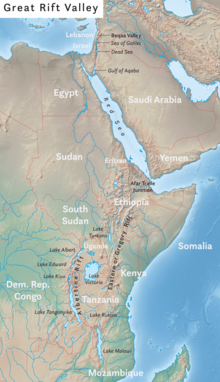 The Ethiopian Rift Valley lakes are the northernmost of the African Rift Valley lakes. In central Ethiopia, the Main Ethiopian Rift, also known as the Great Rift Valley, splits the Ethiopian highlands into northern and southern halves, and the Ethiopian Rift Valley lakes occupy the floor of the rift valley between the two highlands. Most of the Ethiopian Rift Valley lakes do not have an outlet, and most are alkaline. Although the Ethiopian Rift Valley lakes are of great importance to Ethiopia's economy, as well as being essential to the survival of the local people, there were no intensive and extensive limnological studies undertaken of these lakes until recently. South of the Ethiopian highlands, the rift valley splits into two major troughs. The Eastern Rift is home to the Kenyan Rift Valley lakes, while most of the Central African Rift Valley lakes lie in the Western Rift. This area includes the Gregory Rift in Kenya and Tanzania. 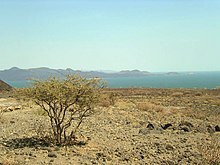 ^ a b "WWF Global 200 Ecoregions – Rift Valley Lakes (182)". www.worldwildlife.org. Archived from the original on December 22, 2004. Retrieved 16 March 2008. ^ "What Lies Beneath". The Economist. 2016-03-12. ^ Hynes, H. B. N. "Tudorancea, C. & Taylor W.D. (Eds) Ethiopian Rift Valley Lakes". www.euronet.nl. Retrieved 16 March 2008. ^ a b Smith, Anthony (1988). The Great Rift: Africa's Changing Valley. London: BBC Books. ISBN 978-0-8069-6906-0. ^ Bos AR, CK Kapasa and PAM van Zwieten (2006). "Update on the bathymetry of Lake Mweru (Zambia), with notes on water level fluctuations". African Journal of Aquatic Science. 31 (1): 145–150. doi:10.2989/16085910609503882.